Ever dream of visiting Japan? Wonder what it's like in spring? Or fall? Here, let these cats show you. 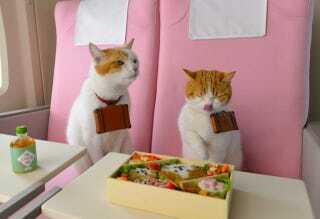 These cats are the "image characters" for Jalan, a travel site in Japan. The older cat is "Nyalan" ("nya" is "meow" in Japanese), and his apprentice is "Deshi." They've appeared in commercials for a while now in Japan, but what I really love is the Nyalan_Jalan Twitter feed. The photos are terrific. You can really get a good idea of the typical things Japanese people like to do in spring, summer, fall, and winter. There are seasonal flowers blooming, seasonal food, and seasonal activities—whether that's flying a kite during New Year's or watching the cherry blossoms.